Sue Grimshaw posted on her twitter about an interview she did with Richelle Mead on the Borders Book Blog. The interview centers around Richelle's Succubus series, and Succubus Blues in particular. 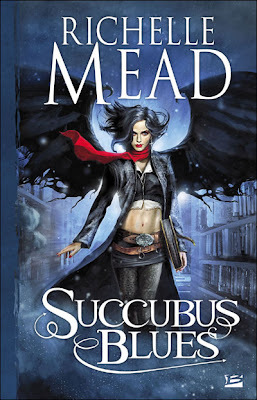 Since Succubus Blues is the first in the series, there aren't really any spoilers in the interview. There’s an epic showdown between immortal powers at the book’s end, which is one of the most vivid and emotional pieces I’ve ever written. I love it. Of course, for spoiler reasons, I can’t give much away here. There’s also a scene in which Georgina’s vampire friend declares he’s going on a low-carb diet, which still cracks me up since blood is about as low-carb as you can get. People hate it when I say this, but none of my characters resemble any celebrities to me. My characters all so unique that the images in my head don’t match anyone out there! The mix of humor and heartache. Georgina’s tormented love life is really harsh to read about sometimes and can get quite dark. On the other side, the book is filled with wacky bits and random pop culture references. I love mixing such wildly different elements and think readers enjoy reading the results. what is the nature of good and evil? I don’t mean in the sense of pulling up any religious debates or beliefs. But, are things always as black and white as we would believe? Georgina’s theoretically an evil creature, but she has a good heart. She frequently runs into those who are seemingly good but prove not to be. I believe there’s a lot of gray in our world and hope readers will think about that and examine their opinions on it. Your can read the rest of the interview and enter the contest here. I've only read Succubus Blues so far. I've recently bought the next in the series, so I'm planning on diving into that soon!